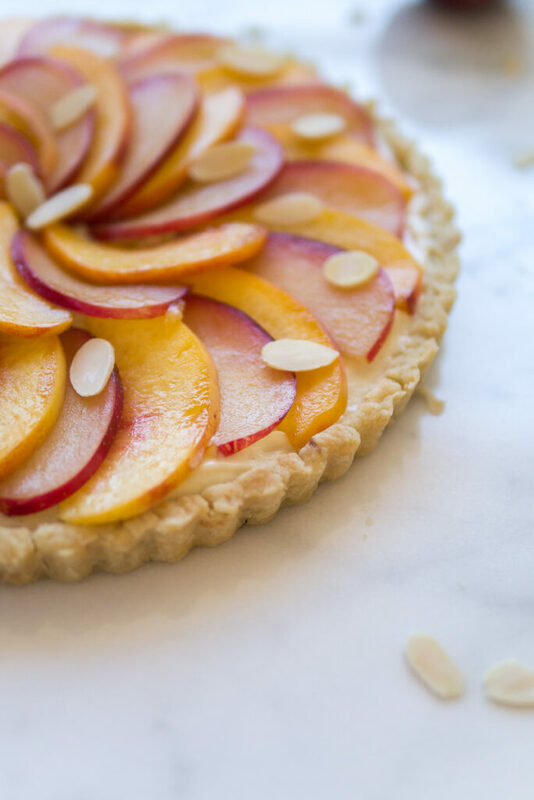 It’s a little bit after stone fruit season, but I wanted to share one of the last fruit tarts I made a couple weeks ago: a peach plum tart with cinnamon pastry cream. It was a last-minute creation for a weekend picnic, but I ended up making perfect use of the peaches and plums we had left in the house! 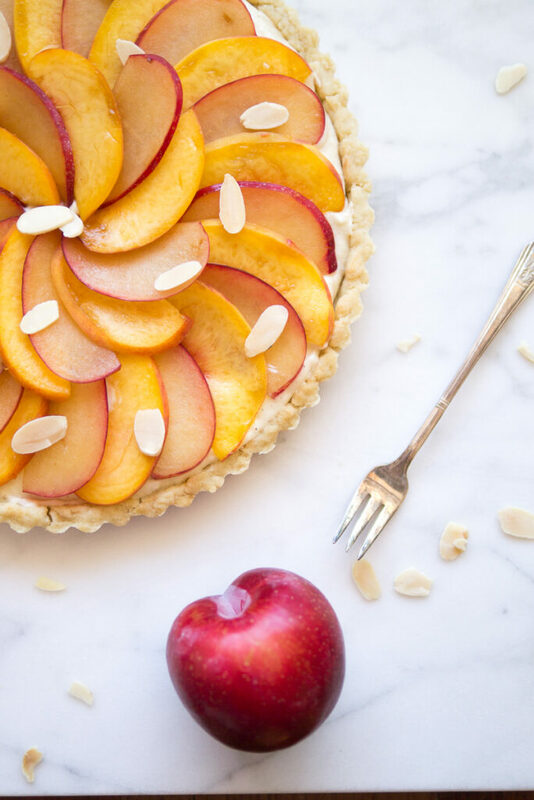 I love the mix of sweet, end-of-summer peaches and the clean tartness of plums combined, but you can use any stone fruits like nectarines or pluots. I also love the contrast of rosy pink and golden yellow tones; next time I’d love to try mixing in some even deeper-toned varieties like elephant heart plums. The tart crust is my trusty melted butter press-in crust, perfect when you don’t want to do any rolling out of dough. It’s flavored with almond extract, which I think enhances the sweetness of the fruit. The fruit rests on top of a pastry cream lightened with whipped cream and spiced with a little cinnamon to give a nod to autumn. It’s simple enough for an afternoon snack and sophisticated enough for dessert at a dinner party. 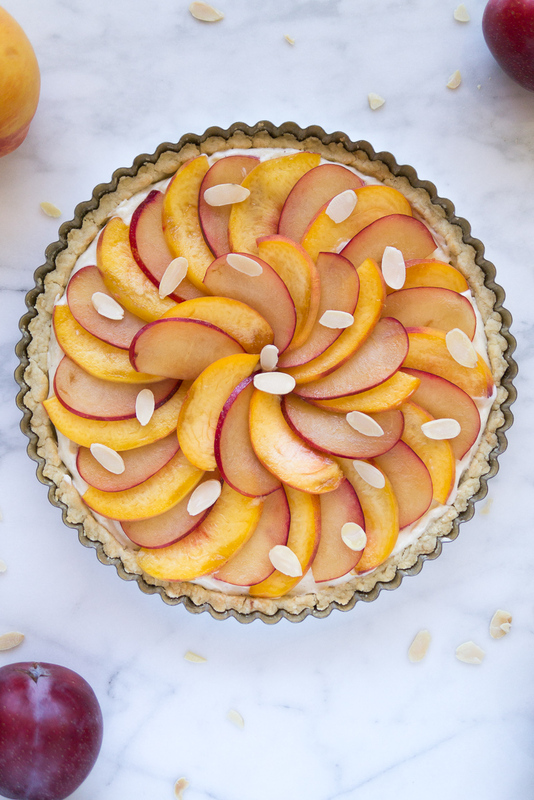 We enjoyed this tart on one glorious Indian summer afternoon, a last happy hurrah right when everyone’s thoughts start shifting towards fall. I apologize for being behind on my cruise recap as well, thanks to a busier-than-expected end of summer. Look for those posts to appear soon, along with some more treats to celebrate the approaching holiday season! Return the entire mixture to the saucepan and cook over medium heat, whisking constantly until the mixture thickens. Stir in the vanilla and ground cinnamon. Wash, pit and slice the peaches and plums into ¼" thick slices. 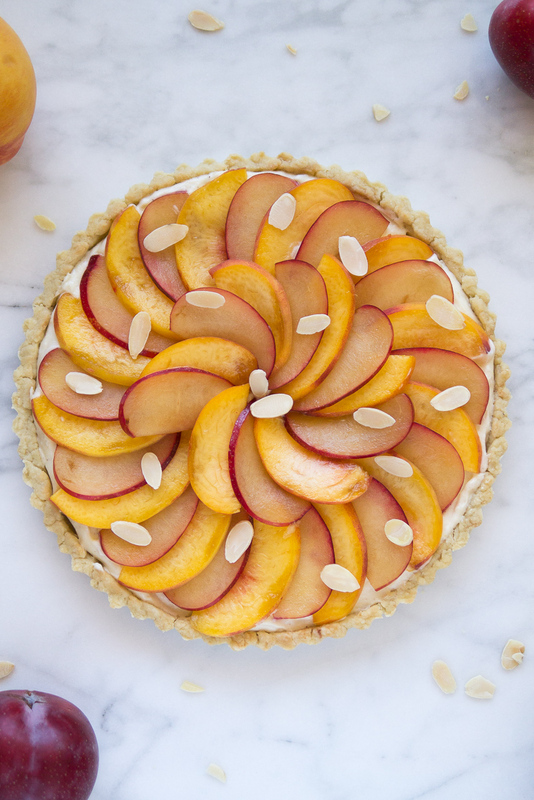 Arrange the peach and plum slices on top. Stir the apricot preserves to loosen it up, then spread lightly on the fruit with a pastry brush.